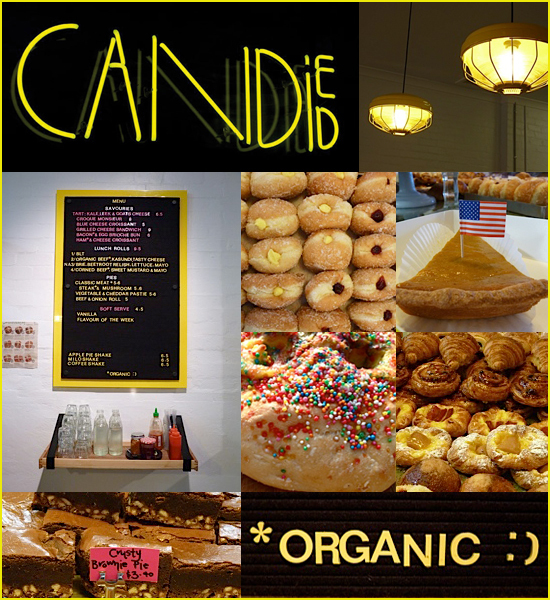 Candied Bakery describes itself as 'an Australian bakery with an American twist'. And with both lamingtons and pumpkin pie on the menu, it's clear to see they're true to their word. Although this delicious Spotswood gem only opened its doors in November last year, the dynamic duo behind Candied Bakery have thirty years of experience between them. Toula Ploumidis and Orlando Artauilla are the creative minds responsible, and represent a new generation of baker. Their creativity shines in this 100% organic bakery, and these guys (quite simply) make baking look cool. From the menu to the decor, every aspect of Candied Bakery is finished with chic urban creativity. The minimalist industrial design is sleek yet playful, and it's clear every inch of the space has been skillfully designed. The eye-catching pops of neon cleverly executed in the interior design also show up in the mouth watering and beautiful food cabinet. It's a feast for both the eyes and taste buds! Each day, the friendly staff serves up sweet and savoury treats, such as nutella croissants, apple pie shakes, chocolate marshmallow cookies and gourmet meat pies. If you're overwhelmed and find yourself in a food daze, effortlessly cool manager, Henry Maxwell, will happily share his recommendations (and to my delight will probably suggest a soft serve at 9am in the morning). The changing menu may appear to be deceivingly simple, but it truly is the type of food experience that will leave you speechless after every bite. When I visited, the bakery had sold out of their popular Korean Chilli Sauce bread. To fill the bread trolley, Orlando didn't hesitate in whipping up a foccacia slab sized fairy bread, pumped full of fresh custard, and coated with butter and 100s & 1000s. The bakers sure do deserve a medal for creative spontaneity! Seriously, what kind of genius randomly decides to make gourmet fairy bread?! Turns out it's the same genius who makes their own gourmet soft serve. Yes, that's right - Candied Bakery also produce their very own soft serve, creating a daring new flavour each week. From peanut butter and jelly, to bounty, to banoffee pie, the weekly changes keep curious customers coming back for more. Eating the banoffee pie soft serve was like my very own Willy Wonka moment, as I felt the same elation that Veruca Salt experienced when she indulged in lickable wallpaper. Dished up in a quaint paper cone, it's a soft serve that looks like vanilla and tastes like toffee, but has a strong after taste of banana. I was amazed how the flavours magically changed, and I quickly realised that Candied Bakery had forever set a new standard for this classic dessert. I asked Toula where she finds her weekly inspiration for their soft serve. Her answer was surprisingly simple, "I brainstorm every Monday night in the aisle of my supermarket". While the crusty brownie pie is their best sweet seller, I have no self-control when it comes to their amazing gourmet donuts. Laced with sugar and injected with jelly or custard, these plump messy treats have become my vice. Candied Bakery's secret donut weapon is the custard, which takes an hour to whisk by hand. It's an old family recipe belonging to Orlando's Italian mother, so it's no wonder it tastes so sensational. That's the beauty of Candied Bakery - everything is lovingly hand made, ingredients are meticulously measured, the food is unique, and the finished product is always flawlessly delicious.